I am writing this from the pool area of the Sheraton Atlanta. 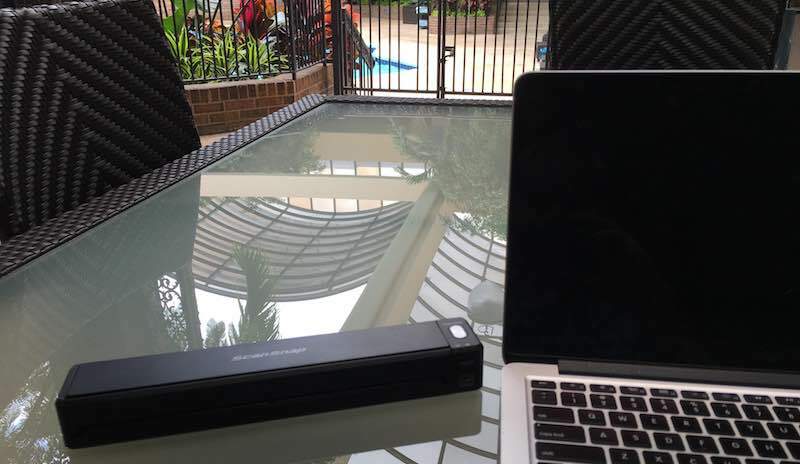 I only mention this because Fujitsu has released their new ScanSnap Cloud feature, and I figure there is no better way to test it out than with the dreaded hotel Wi-Fi connection. 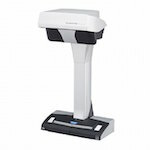 ScanSnap Cloud is a way to scan documents from your ScanSnap iX500 or iX100 directly to the cloud service of your choice without needing to be connected to a computer or mobile device. Fujitsu says more are on the way soon. 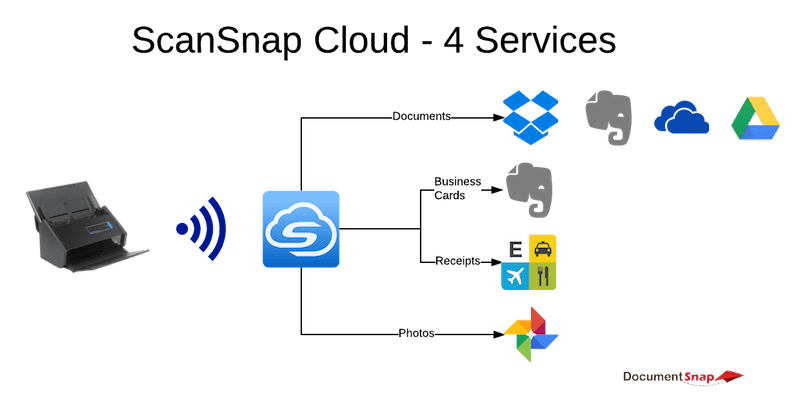 You can download the ScanSnap Cloud software now from their site. It will not show up in Online Update. When ScanSnap Cloud launched it was North America-only, but now it is available in North America, Japan, Europe, the Middle East, and Africa. It doesn’t appear that it is available in Australia yet, but I’d love to hear from the Aussie readers if that is in fact the case. Here's what ScanSnap Cloud is NOT: Fujitsu is not getting into the cloud storage game, so you don't have to worry about them hounding you to sign up for their paid service or anything like that. The new feature is a (free) way to get your documents from your ScanSnap to where you want them to go. If you don't want to store your documents in the cloud, you can keep using your ScanSnap exactly how you are using it now. Once you configure your ScanSnap for ScanSnap Cloud, you can decide where those scans should go. If you'd like, you can have everything go to one place. Here's an example with my poor flowchart skills. Your ScanSnap connects via Wi-Fi to your router. 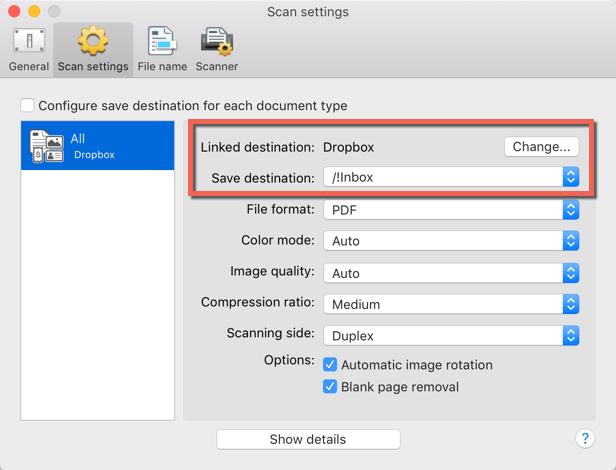 When you scan, it sends the document to the ScanSnap Cloud service, which then sends it to Dropbox. Pretty simple, but you can take things a bit further. 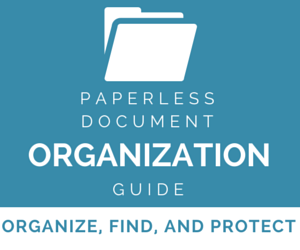 You can tell it to sort your documents into up to four categories, and have a different cloud service for each type. When you scan to ScanSnap Cloud, it can automatically detect the type of document and save it accordingly. In this example, it is sending documents to Dropbox or Evernote or OneCloud or Google Drive, business cards to Evernote, receipts to Expensify, and photos to Google Drive. This is similar to the automatic sorting of the ScanSnap Evernote Edition, but it is on steroids because you can send it to completely different specialized services. 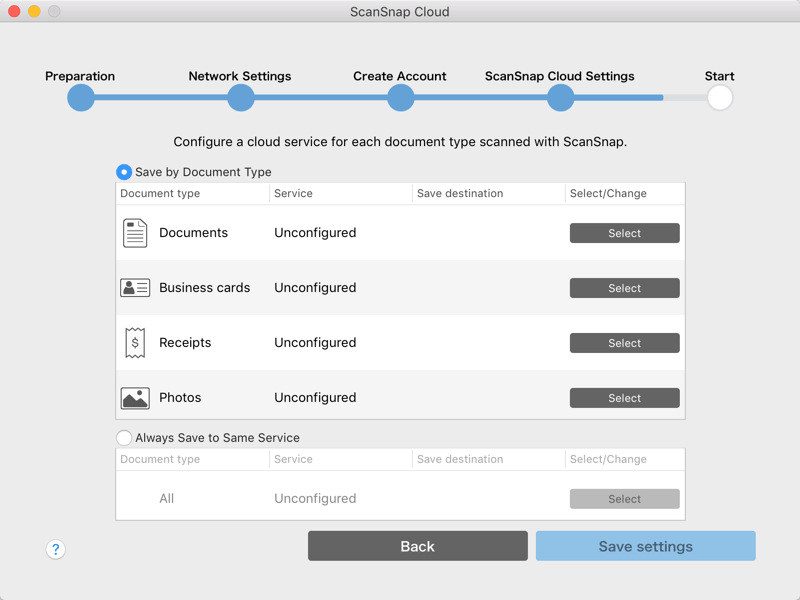 To configure ScanSnap Cloud, there is a special application for Mac and Windows and a mobile app for iOS and Android. When you first start it up, you are asked to sign in or create a ScanSnap Cloud account. You'll then plug in your ScanSnap to your computer and it will need to update the firmware to be able to do the new magic cloud uploading. 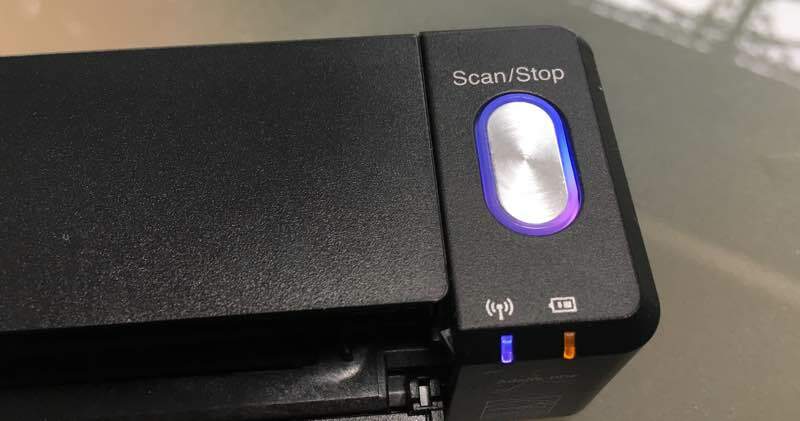 Once your ScanSnap has updated and is connected to Wi-Fi, the light will change to purple. That's how you will know you're connected to ScanSnap Cloud. You'll then be asked which cloud service you'd like to save your documents to. If you want to just get up and running quickly, choose Always Save to Same Service and then hit the Select button. You can choose your service and go. Alternately, choose Save by Document Type and then choose your service for Documents, Business cards, Receipts, and Photos. You can, of course, change all this later with the ScanSnap Cloud application. Hit Save Settings and you'll be good to go. Let's do an example. I have configured ScanSnap Cloud to scan everything to Dropbox. Now whatever I scan should magically appear in my !Inbox folder in Dropbox (a folder I selected — you can select whichever Dropbox folder you'd like). I scanned a document, and a few seconds later it appeared in Dropbox in my !Inbox folder. Now let's try a different example. I will configure it to scan to different services depending on the type of document. 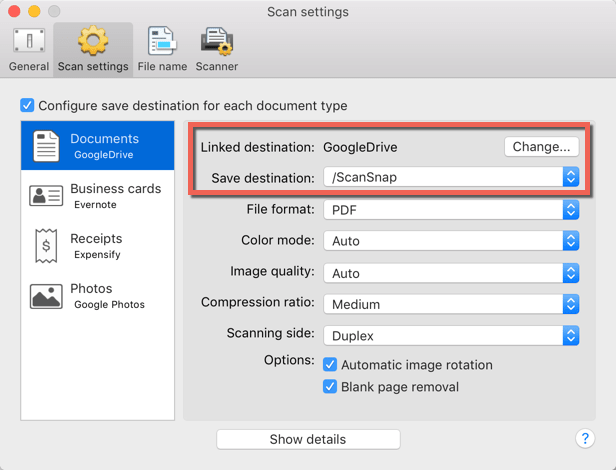 I'll scan to Google Drive for documents and configure it to scan to a folder called ScanSnap. 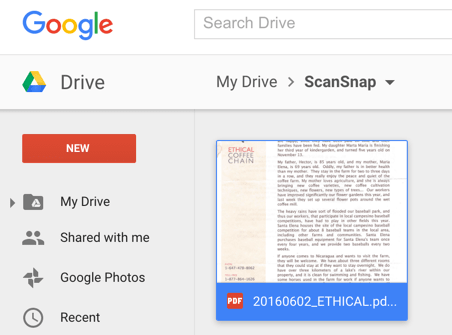 I scanned the letter, and it appears in Google Drive in a newly-created ScanSnap folder. Since I've set things to automatically detect the type of document, I set business cards to go to Evernote. Once nice feature of scanning to Evernote is you can choose which notebook you want to save to. Unfortunately you can't choose tags, but maybe that will come someday. When I scanned a business card, it appeared in my Cards notebook (that I selected) within a few seconds. I was hoping that Evernote would recognize it as a business card and do its Linkedin-lookup-magic like the ScanSnap Evernote Edition, but no such luck. I suspect that Fujitsu will support more business card services in the future. You can scan receipts to any service you like as PDFs or JPGs, but if you want to add some extra processing you can choose Expensify as your cloud service. It just so happens that I use Expensify when I travel, so I was very excited to see this integration. 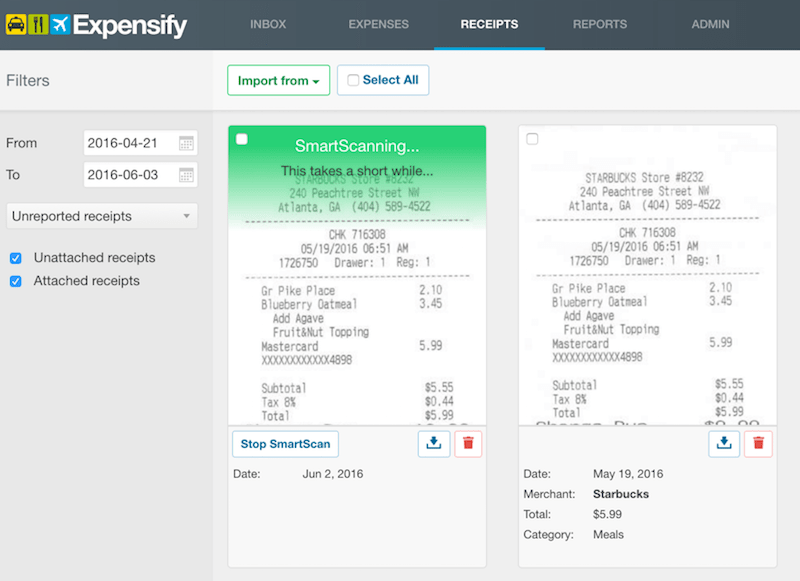 When I scanned, the receipt appears in Expensify to do its Smart Scanning magic. In this screenshot I show before and after. From there in Expensify you can create and submit expense reports, export to Quickbooks, and do all sorts of other expense-y things. 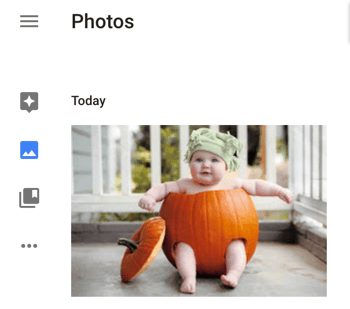 By now you probably have the idea, but just for completeness I set it to send photos to Google Photo. You can, of course, send them to Evernote, Dropbox, OneDrive, or whereever you'd like. When I scanned a photo, it saved it right to Google Photos. 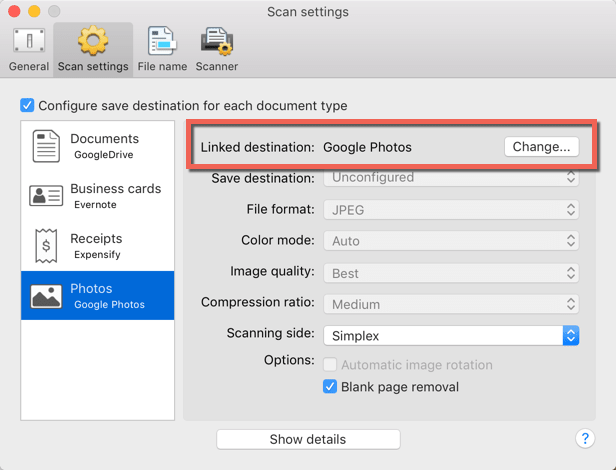 Earlier in this article I did a bit of foreshadowing for an interesting new feature of ScanSnap Cloud: an option to automatically name scanned documents. Now, this isn't anywhere close to the level of using Hazel or DropIt, but is a bit more powerful than what the ScanSnap could do before. 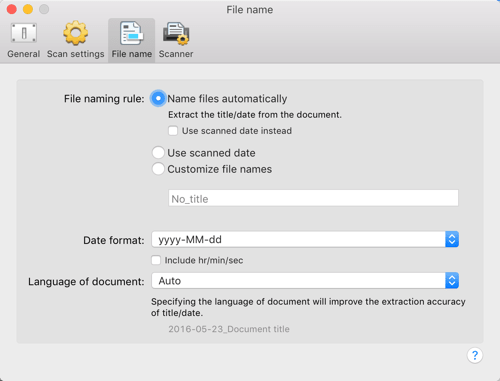 In the ScanSnap Cloud settings, you can select Name files automatically. This will try (and I mean try) to pull the title and date out of the document and use it in the filename. As far as I can tell it only seems to work on documents and not receipts or business cards. I've also found that the document needs to be quite well structured. In an earlier article I showed a scanned letter from Ethical Coffee Company. ScanSnap Cloud found the word ETHICAL but did not find the date. When that happens, it just uses the scanned date. I scanned a Sheraton bill and it did find Sheraton and allllllmost found the date, but got the year wrong. This Kal-Tire bill is well structured like a normal invoice and it pulled the title and the date without problems. So, this automatic file naming is an interesting feature and one I hope they improve over time, but it's not something you want to rely on unless you have very commonly-structured documents. If you don't like it, you can turn the option off and just have it name the document with the scanned date or other characters. 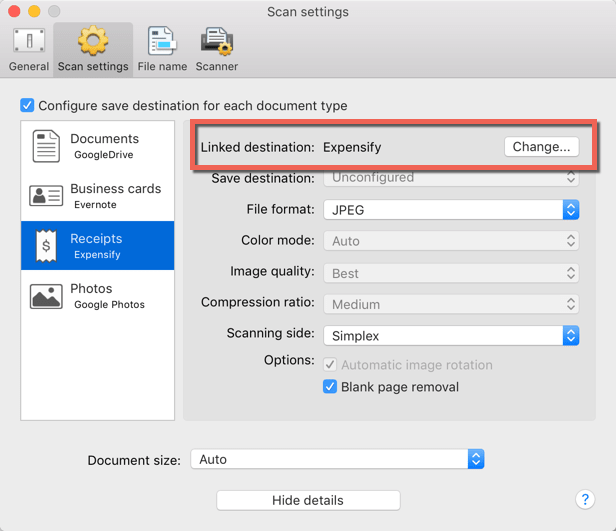 There are a few limitations you should be aware of when you're using ScanSnap Cloud. 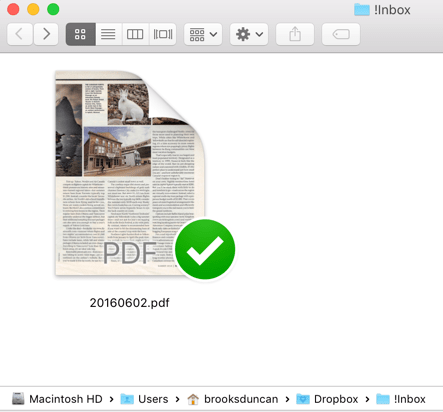 If you are a ScanSnap power user and have Profiles set up in ScanSnap Manger to split your documents into one PDF per x single or double sided pages (as outlined in my Unofficial ScanSnap Setup Guide), you can't use those Profiles with ScanSnap Cloud. 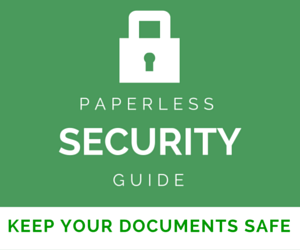 All documents that you scan together of a similar type will go into one PDF in the cloud. So, if you have five pieces of paper and they should go into five PDFs, you'll want to do five scans vs. one scan and having it auto-separate like you may be used to with your iX500. Not a big deal, but something to keep in mind. 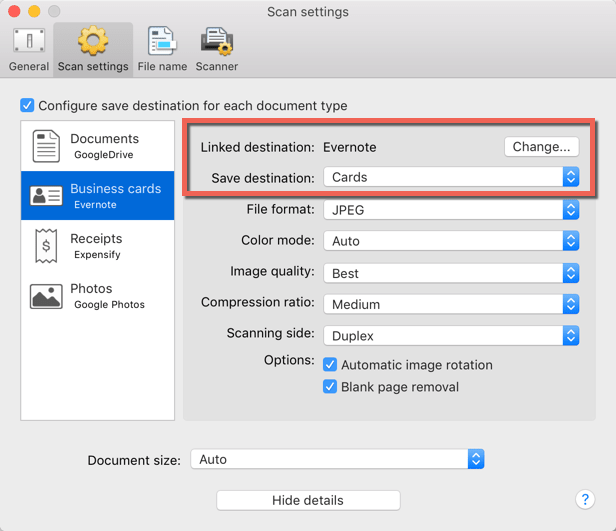 One trick that the folks in the Evernote forums came up with for the ScanSnap Evernote Edition works here: if you're scanning a stack that includes different types of documents (receipts, business cards, etc. ), put the receipts and business cards between the documents. That way it will separate the documents into different PDFs. The second thing to keep in mind is that there is no server-side OCR function. So if you scan to to ScanSnap Cloud, those PDFs will not be searchable like they would be if you scanned to your computer. 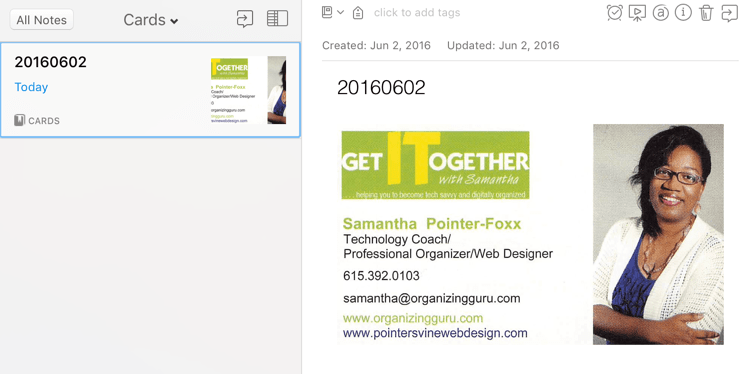 If you scan to Google Drive or Evernote, you could use their searchable PDF features, or if the PDFs download to your computer later, you could apply OCR after the fact. 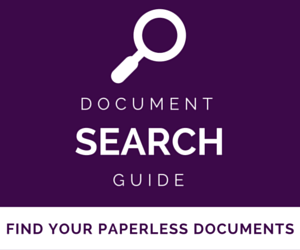 Update 01/22/2018: ScanSnap Cloud can now make PDFs searchable! Read more in this ScanSnap Cloud OCR article. Finally, you will want to keep in mind that ScanSnap Cloud itself is not a cloud storage service. As you will see in a future blog post, you can access the documents you've scanned using the ScanSnap Cloud app and do some simple manipulation, but I am told that the service will only hold onto scans for 2 weeks. After 2 weeks, they'll be removed from Fujitsu's server. Think of the ScanSnap Cloud service as a temporary holding bin. It stores your documents just long enough to get them to their final destination (Dropbox, Google Drive, OneDrive, etc.) and keeps them around for a tiny bit just in case you change your mind about where you wanted them to go. Let's start with the obvious: if you're not comfortable storing your documents in the cloud then the ScanSnap Cloud feature is not for you. Assuming you are OK with the concept of cloud storage in general, then the question becomes how secure is ScanSnap Cloud? Since DocumentSnap readers are a smart bunch, I knew you wouldn't go for "it's secure, we promise!" like you usually hear from cloud vendors. I bugged them to give me a bit more information. The ScanSnap folks wisely did not try to run their own server infrastructure. They use Microsoft Azure as the data storage. If you're interested in these sorts of things, here is Azure's security information. The security of our customer’s information is of the utmost importance to Fujitsu. As part of that goal, we have selected Microsoft Azure as the preferred and strategic cloud for our ScanSnap Cloud service. While documents are not encrypted, the Microsoft team is constantly investing in the security of the Azure platform and the integration with Microsoft's cloud infrastructure gives ScanSnap customers a trusted platform for the security of their information. Hopefully they do add extra encryption-at-rest in the future. "I'm Angry Because My Perfectly Good Older ScanSnap xxxx Doesn't Support ScanSnap Cloud!" Sometimes Fujitsu releases a new feature that, for technical or sales reasons, only works on current ScanSnaps. When this happens, there is a segment of the customer base with older ScanSnap models that gets quite upset that their model doesn't support the new feature. I hope it is obvious that in this case only the iX500 and the iX100 support ScanSnap Cloud because they are the only models that can scan wirelessly. When Fujitsu first released the iX500, they kept going on about the "GI chip" that they added. I have to admit that I didn't really see the big deal at the time, but now I am coming around — it lets them do things like add this feature to existing models without needing to release a whole new scanner. 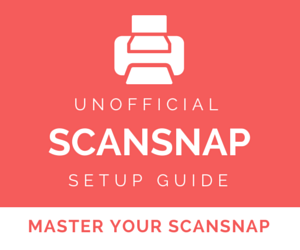 By now you are probably wondering how you set up and configure all these ScanSnap Cloud features. 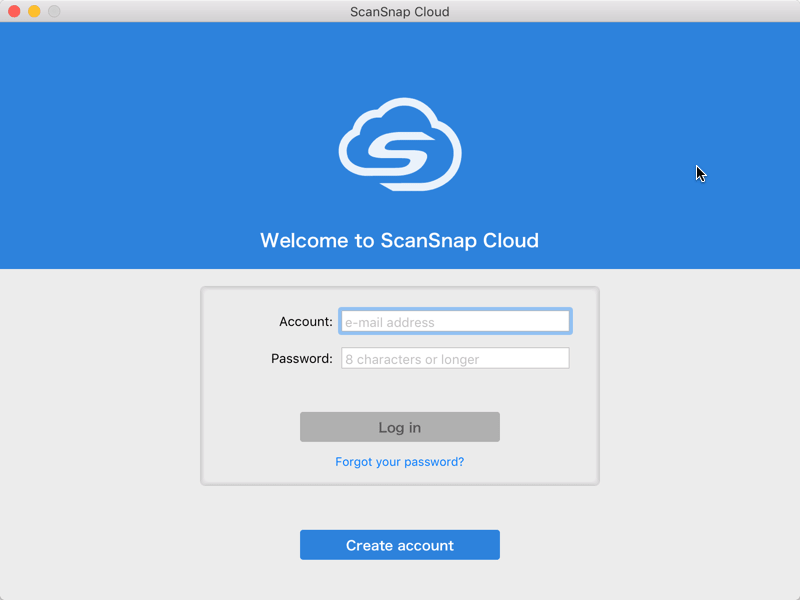 There is a ScanSnap Cloud application for Mac and Windows, and an app for iOS and Android. I will do a future blog post about using the apps, but for now you can download them all at the their site. 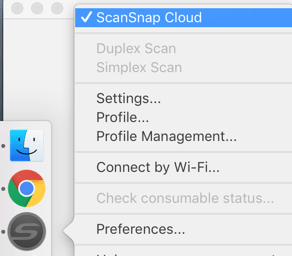 As mentioned earlier, you can switch between using ScanSnap Cloud and using a normal ScanSnap connection via USB or Wi-Fi to a computer. To switch, make sure your ScanSnap is powered on and then right-click on the ScanSnap Dock (Mac) or Notification Area (Windows) icon. 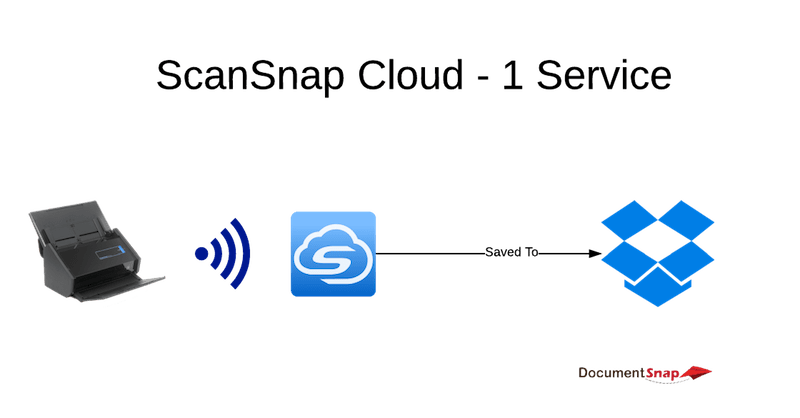 Enable or disable ScanSnap Cloud. What Do You Think Of ScanSnap Cloud? To me, ScanSnap Cloud is a good way to support computerless scanning without Fujitsu trying to get into the cloud storage game (something I am not sure anyone wants them to do). It could also be a good solution for people who have wanted their ScanSnap to be able to scan to more than one computer wirelessly. Now it can scan to the cloud and you can sync/access it that way. I like it, but I'm curious about your thoughts. Please drop a comment and let us know what you think about this approach. I am trying to scan copies of receipts to my QuickBooks online. Where does it show up in QBO? I see it in my cloud folder and it says it is in QBO but where is it in QBO? Do I have to configure QBO to “accept” it? We need integration with Google Drive File Stream. Google has updated their G Suite with new software. The integration is broken. I have found a workaround for now. next thing should be tag detection in the cloud. Is there any chance to scan directly from my iX500 to my Synology NAS? Should be possible at least via WebDav…but I’ve not found any solution beside the workaround via Dropbox… and I don’t like workarounds at all! I have exactly this configuration of ScanSnap iX500 delivering images directly to my Synology DS216 NAS, using SecureScan Virtual Disks as seen in the image at the URL below. Please let me know if you have questions. Can you elaborate more how it’s done? Do you perhaps know what Android app is needed? The website doesn’t provide a working link. And Google Play has two apps – both with suspiciously low number of 500 installs. Do you know if this now works outside North America, like Australia for example. This is indeed good news and the funtionality I’ve been waiting on. Question for you if you don’t mind. You say that server side OCR isn;t quite as good as client side. Can you be specific? What differences do you see and what are the limitations of server side?